Today's random set is 4893 Revvin' Riders, released in 2006. 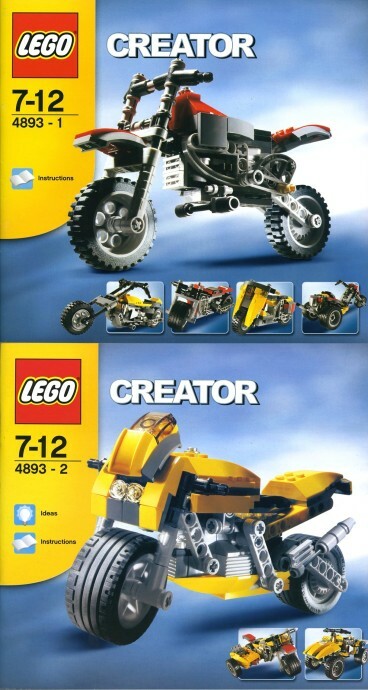 It's one of 21 Creator sets produced that year. It contains 360 pieces, and its retail price was US$20/£19.99. It's owned by 798 Brickset members. If you want to add it to your collection you might find it for sale at BrickLink or eBay. Huh, apparently despite dropping the Designer Set moniker, Creator was still using the Quick Build, Experienced Build and Advanced Build ratings. That's nice, I guess. These days the ratings are used by Classic and have slightly different names. Also apparently the "n-in-1" marketing wasn't always just 3-in-1. Looks like this (2006) was the first year they started putting that on boxes, eventually settling on the 3-in-1 standard we know today. I'm only just learning these facts now because the last sets I owned before my Dark Ages were Designer Sets #4506-1 and #4508-1, from the same wave in 2004/05 (as well as the original wave of the X-Pods discussed 2 days ago). Amazing set, looks like it covers all the grounds. Really cool-looking set! Believe it or not, I was actually looking at all the Creator sets from this era, on Brickset, including this one! @Koolbrix2018, I can't speak for 4506, but I own 4508 Titan XP, 4507 Prehistoric creatures and 4894 Mythical creatures. Sets from that era used a lot more standard plates and bricks than they would now. They did use the then new racket hinges, many curved parts and a lot of interesting colours in large quantities such as dark green, dark red, sand blue etc. The builds were more involved than anything from the 90s though, and used some of the earlier SNOT techniques. But unlike now, the cores of the models weren't SNOT and technic and special parts like they would be now. Still, the end results were often stunning! The models were large and full of detail and shaping. But only using the racket hinge pieces for the joints on Titan XP made it a bit unstable. But it could still stand up! If you like the look of them, I'd highly recommend them. They were some of the better things made with the 2003-2006 era of parts. Got this at a garage sale in 2008 or 2009. It was missing several pieces so I couldn't build it. I still have the thin tires as well as the soundbox. I submerged that thing in water when making a speed boat many years ago as a kid, and it still works to this day! @Koolbrix2018: They are fun, the selection of parts isn't nearly as diverse or overwhelming as today but there's still enough variety to explore some really interesting techniques and add a decent amount of detail. The models in 4508 are incredible and I still have my 4508 MOC from when I was 13 built up. As Binnekamp said, SNOT wasn't yet as integral as it is today but there are plenty of brackets and a couple of SNOT bricks used to good effect. Oh, yeah, and the ratcheted hinges, back when those were the main source of articulation in System sets. 4506 has a lot of fancy ideas in the idea book for creating all kinds of marine creatures, but I have to admit they weren't as compelling as those in 4508. I explored a couple of alternate builds and MOCs with it but ultimately returned to the main "front of the box" builds which I rebuilt just last year. It is still one of my all-time favorite sets though, given my love for marine species and the fact that I got it for my 13th birthday. Not to mention it's been reimagined in the form of #31088-1. In general I'd say Designer Sets were among the best Creator had to offer, even for the relatively lesser part variety of its time.